Bright auroras are clearly visible in this composite photo of Uranus, which combines two different observations made by NASA’s Hubble Space Telescope (one each for the planet’s rings and auroras) and one image by the agency’s Voyager 2 probe, which flew by Uranus in 1986. Uranus is not just a featureless ball of bluish-green gas. "They become caught in powerful magnetic fields and are channeled into the upper atmosphere, where their interactions with gas particles, such as oxygen or nitrogen, set off spectacular bursts of light," they added. 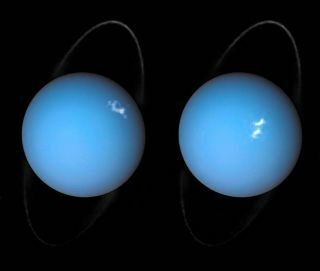 This isn't the first Uranus aurora observation for Hubble; the telescope also captured them back in November 2011. The newly released photos also show Uranus' ring system, which appears to circle the planet's poles. But the rings actually gird Uranus' equator, just like those of Saturn: Uranus orbits the sun on its side, with the planet's spin axis pointing nearly directly at the star. Astronomers think the gas giant was knocked off-kilter long ago by a collision with an Earth-size planet, or perhaps by a series of impacts with smaller objects. Uranus is the third-largest planet in the solar system, with a diameter about four times that of Earth. Uranus lies about 19 times farther from the sun than our planet does, and it takes 84 Earth years to complete one orbit. The Hubble telescope launched on April 24, 1990, aboard the space shuttle Discovery and was deployed a day later. The space telescope is still going strong, as is Voyager 2; the spacecraft, which launched in 1977, is currently about 12.8 billion miles (20.6 billion kilometers) from Earth and is expected to pop free into interstellar space soon. Voyager 1 entered interstellar space in August 2012 and is also still sending data home to its handlers.